Look at all the lovely, identical snakes for sale at the pet store! How can I choose? How do you stand out in a crowded field? Our town has a taco shop on nearly every street. How can they all stay in business? Our Cuisine Quest to eat at every restaurant in our town took us to a taco shop we had never been to before. My husband was excited that they had posole. Posole is a soup with hominy and meat, often served with tortillas, cilantro, radishes, avocado slices, cabbage, or onions. Not many taco shops have red posole! You can see how difficult it is to make here. 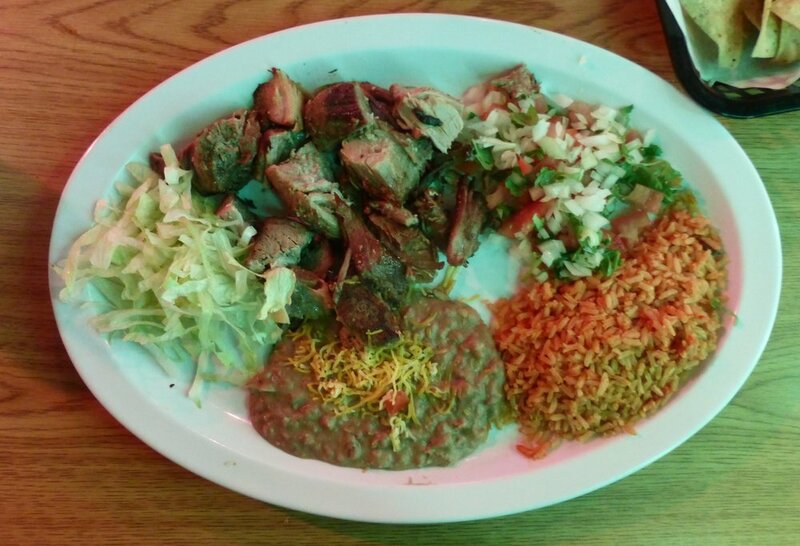 I ordered a carnitas plate, which is pork served with items to eat separately, or together in a tortilla. The pork carnitas were delicious, not too fatty, and enough for leftovers. Again, my question is, how do you stand out in a crowd? Personal attention. For this restaurant, the lady at the counter seemed to know everyone who came in. These individuals and families come again and again because they know someone will show that they are happy to see them! Would we come back again? For me, since there are so many taco shops in my town, I will be more picky. I want a place with Coke products. And, I prefer my guacamole to be more chunky. Yes, those are little things, and with this restaurant being so friendly I am uncomfortable saying this, but I would go elsewhere. My husband will be back again for that posole! Unless the next taco shop has posole that is just as good….One fork up.